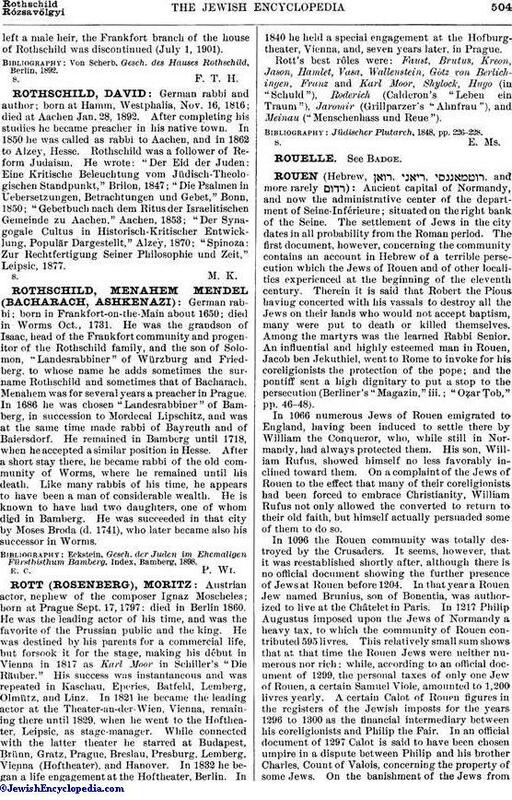 German rabbi; born in Frankfort-on-the-Main about 1650; died in Worms Oct., 1731. He was the grandson of Isaac, head of the Frankfort community and progenitor of the Rothschild family, and the son of Solomon, "Landesrabbiner" of Würzburg and Friedberg, to whose name he adds sometimes the surname Rothschild and sometimes that of Bacharach. Menahem was for several years a preacher in Prague. In 1686 he was chosen "Landesrabbiner" of Bamberg, in succession to Mordecai Lipschitz, and was at the same time made rabbi of Bayreuth and of Baiersdorf. He remained in Bamberg until 1718, when he accepted a similar position in Hesse. After a short stay there, he became rabbi of the old community of Worms, where he remained until his death. Like many rabbis of his time, he appears to have been a man of considerable wealth. He is known to have had two daughters, one of whom died in Bamberg. He was succeeded in that city by Moses Broda (d. 1741), who later became also his successor in Worms. Eckstein, Gesch. der Juden im Ehemaligen Fürstbisthum Bamberg, Index, Bamberg, 1898.